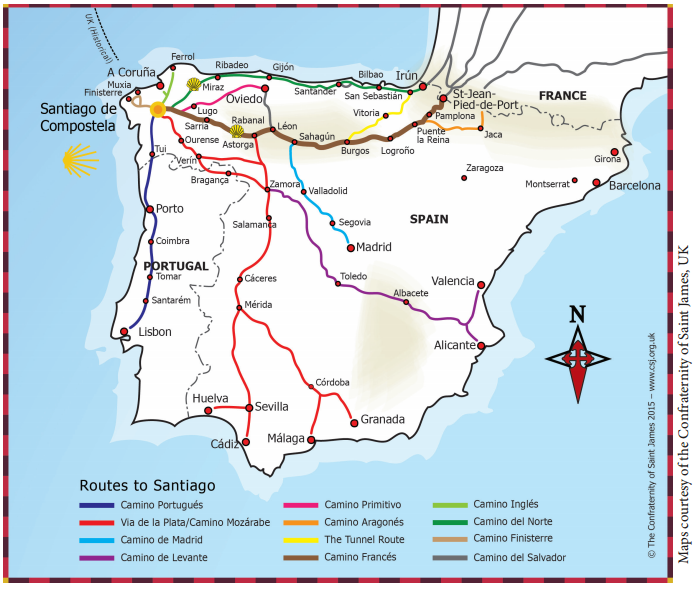 The Camino de Santiago, also known by the English name Way of St. James, is the name given to any of the pilgrimage routes to the shrine of the apostle St. James the Great in the Cathedral of Santiago de Compostela in Galicia in north-western Spain, where tradition has it that the remains of the saint are buried. The Camino was one of the most important Christian pilgrimages during the Middle Ages, together with those to Rome and Jerusalem, and it was a pilgrimage route on which a plenary indulgence could be earned. 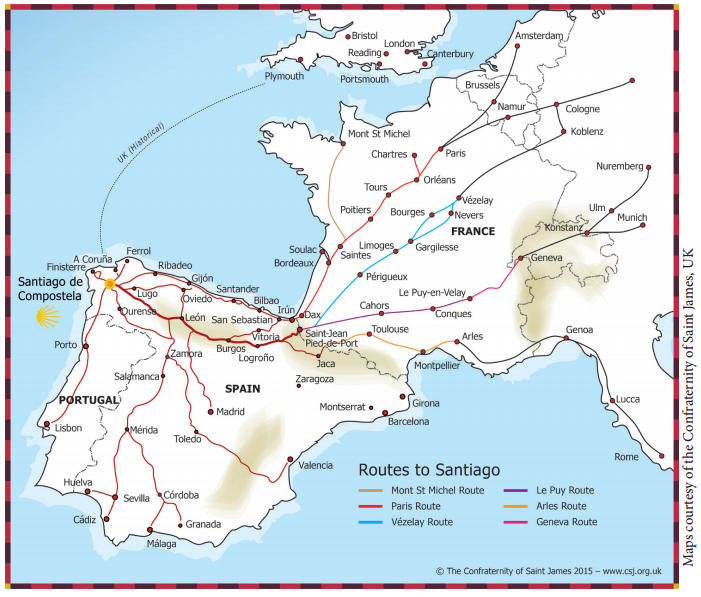 There are dozens of pilgrimage routes to Santiago de Compostela. The most popular is the Camino Francés or French route from the Pyrenees to Santiago de Compostela. Other main routes through Spain include the Via de la Plata from Seville, the Camino del norte along the north coast, or the Camino Portuguese from Lisbon through Portugal and Spain. There are other major routes in France, from Arles, Le Puy-en-Velay, Vezelay, and Paris. Old routes are now being researched and resurrected throughout Europe (Germany, Hungary, Slovakia, Switzerland – to name just a few). Traditionally, as with most pilgrimages, the journey began at one’s home and ended at the pilgrimage site. During the Middle Ages, the route was highly travelled. However, the Black Death, the Protestant Reformation, and political unrest in 16th century Europe led to its decline. By the 1980s, only a few pilgrims per year arrived in Santiago. Later, the route attracted a growing number of modern-day pilgrims from around the globe. In October 1987, the route was declared the first European Cultural Route by the Council of Europe; it was also named one of UNESCO’s World Heritage Sites. The credencial or pilgrim passport, a distant successor to the safe-conducts issued to medieval pilgrims, is a document printed and issued by the cathedral authorities in Santiago, and made available to bona fide pilgrims at points along the route – e.g. at Roncesvalles, and at some churches and refugios – and through the Spanish and some international associations. The Canadian Company of Pilgrims is authorized to issue Credencials. Learn more and order our Credencial here. In Santiago de Compostela, a year is considered Holy or Jacobean if July 25th, Saint James Day, falls on a Sunday. On such years a special door from the Plaza de la Quintana into the cathedral, the Holy Door (Porta Santa) is opened to pilgrims arriving in Santiago. The next Jacobean Holy Year is scheduled to take place in 2021. However, 2016 was an exceptional year for pilgrims to Rome and to Santiago de Compostela, as Pope Francis declared that year a ‘Holy Year of Mercy’. Santiago Cathedral officials confirmed that the Holy Door of the cathedral would be open for this special year. During Holy Years there is a considerable increase in the numbers of pilgrims travelling to Santiago to enter the Cathedral by this “Holy Door”. The “Holy Door” was open from December 8th, 2015 until November 20th, 2016. It is not due to reopen again until 2021.